AS a young Australian, for a long time I have wanted to make the pilgrimage to Gallipoli to see the place which is so ingrained in our nation‘s short history. So when my husband and I realised we were going to be in the region for Anzac Day 2009, it was far too good an opportunity to pass up. One of the first things that struck me as we drove through the Gallipoli Peninsula was how beautiful and peaceful the area is. As we had begun our journey in Istanbul, the road we took to Gallipoli follows along the Dardanelles and at times the opposite shore is so close you can see the houses and towns. Arriving at Gallipoli was like arriving at a mad house. Hundreds of buses jostled to get through as the Jandarma - Turkish traffic police - tried to keep everyone in order. Once we made it to the check in point, we joined the line of buses to be given our bus number passes and have the rules and regulations explained to us by an official. Before making our way to Anzac Cove, where we spent the night, we visited some of the cemeteries including Lone Pine (Australian memorial) and Chanuk Bair (New Zealand memorial) where we saw several restored trenches. Although thousands of soldiers - from both sides- are buried in these cemeteries, definite identities of only a few are known so there are only headstones for those identified as being buried in that cemetery. 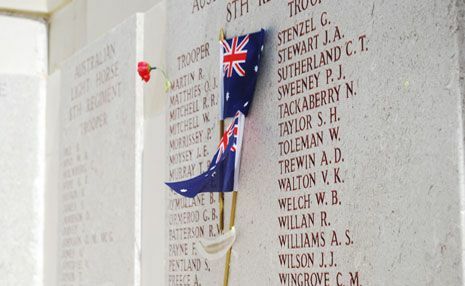 Those who are buried in locations unknown are commemorated on the Australian memorial at Lone Pine. On arrival at Anzac Cove we joined the line of people waiting to go through the security check-points. We were divided into male and female lines, and just like the toilets, the men’s one moved five times as fast as the women’s. Security officers searched our bags to ensure we weren’t trying to bring any alcohol or dangerous objects on to the site. There was also some concern about opened bottles of water, but most of the officers just asked for the lids to be taken off so they could have a sniff to ensure it wasn’t Vodka or Raki (a local aniseed flavoured drink which is guaranteed to knock your socks off - otherwise known as lion’s milk!). Despite having seen footage on television, I was quite surprised at how small the area used for the dawn service is. The four small grass areas were already full of people laying down on their sleeping bags so we had no choice but to go to the grandstands. These have low backed, hard plastic bucket chairs so we were fairly certain we wouldn’t be getting much sleep. The sun did not set completely until nearly 8pm, and then the cold really began to set in. It was so bitterly cold that despite my singlet, thermal long pants and top, two shirts, a jumper, jeans, water-proof jacket, scarf and 5 degree rated sleeping bag, I could not get myself warm. Some people (including myself) tried to lay down on the wooden floor of the grandstand and sleep, but the cold seemed to seep through the wood into your bones. Eventually we wrapped ourselves in the tarp we had brought to use under our sleeping bags if we had got space on the grass. We were still far from warm, but it seemed to protect us a little from the biting wind. The Gallipoli peninsula is a slender finger of land forming one coast of the Dardanelles, and Anzac Cove is right near the point at which the Dardanelles run into the Aegean Sea, meaning there is no escaping the freezing sea winds. I could not help but wonder how the Anzac troops survived their first night at the cove. Wet and exposed, I am sure they must have thought they had landed in hell and it had frozen over. I will admit I wondered why on earth I, or anyone else, had wanted to experience this, but as I thought about it more, it hit me that the distress I was feeling was most likely exactly how the Anzacs would have felt on their first night at the cove and it made me feel a little closer to them, a little more like I understood their experience. I was just grateful that I only had to try to keep warm, rather then keep myself alive and fight a war. Throughout the night some entertainment was provided and at one point the ABC’s Miriam Corowa interviewed some fellow pilgrims who had family connections to the Anzacs who served at Gallipoli. There was some amazing stories of courage, bravery and tragedy. All throughout the night, people continued to arrive for the service and slowly the grandstands filled up until there was some 7500 people crowded into the tiny little piece of land. Apparently normally there is more like 12,000 people. The mind boggles at how they all manage to fit in. As the sun began to rise, the cliffs behind us were back lit with the first light. It was such a beautiful sight and they nearly appeared to glow around the edges. In the minutes leading up to the dawn service, we were asked to maintain silence and the atmosphere during this time was amazing. The respect being shown by all generations present was extremely moving. 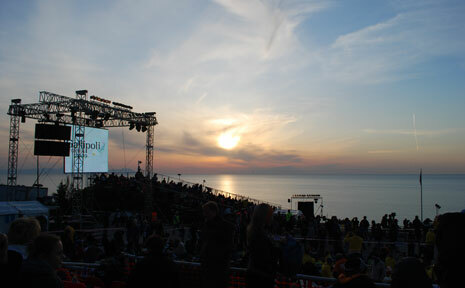 We watched most of the proceedings for the dawn service on the two big screens as we were unable to see the platform down the front from our grandstand up the back, despite only being about 100m away. And still the crowd stayed so quiet, hanging on the every word of those speaking. The most moving moments for us were the sound of 7,500 people singing along to the national anthem and the playing of the last post. After the dawn service we slowly filtered up the path to Lone Pine for the Australian service, and then to Chanuk Bair to meet our tour bus. This was probably the most frustrating part of the trip as nobody knew when their bus was coming, you simply had to listen for your bus number to be called. When there are several hundred buses, this can take a long time and it’s less than fun when you are sleep deprived, hungry and hot. Something that I hadn’t thought too much about before was that the Anzac and Allied troops were not the only ones in this war. Gallipoli has a lot of meaning for Turkey too, and it was during the battle there that Mustafa Kema Ataturk, who later became the founder of the Turkish Republic and its first President, made a name for himself. When the Anzac troops landed, the Turkish troops put their tails between their legs and ran, but Ataturk ordered them back and under his leadership, they held the Anzacs off. It is interesting to think that had this not happened, Turkey could be a very different place today. The Turkish have their own memorial at Gallipoli where they also hold a commemorative service on Anzac Day as well as playing a part in the Australian and New Zealand services. 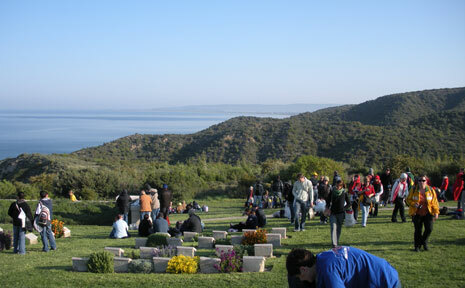 Gallipoli was an amazing experience, but I would not go on Anzac Day again. To some extent I feel that we missed out on some of what Gallipoli has to offer as our visit was so structured and we had no time to go and explore things at our own pace. However, it truly was an awesome experience and I don’t regret going. I would like to go back again some day and just spend some time wandering around and exploring all that it has to offer. If you plan on visiting Gallipoli for Anzac Day, I would recommend taking plenty of layers of clothing, thermals and a sleeping bag. The weather can be quite hot during the day though, so also be sure to have clothing suitable for when it warms up as well as sunscreen, a hat and good, sensible shoes for hiking - it‘s about a 20 minute hike to Lone Pine and another 45 to Chanuk Bair. There is food (including ice cream, which was strangely attractive and good despite the cold) available readily and quite cheaply at the site, but if you are wanting to eat healthily, you will need to take your own food. Don’t worry about things needing refrigerating, it’s cold enough that it won’t matter. Don’t expect to be comfortable for any part of the trip. You will be squished in with thousands of other people and spend the entire night freezing, before you boil during the day and then have the frustrating wait for your bus to arrive. 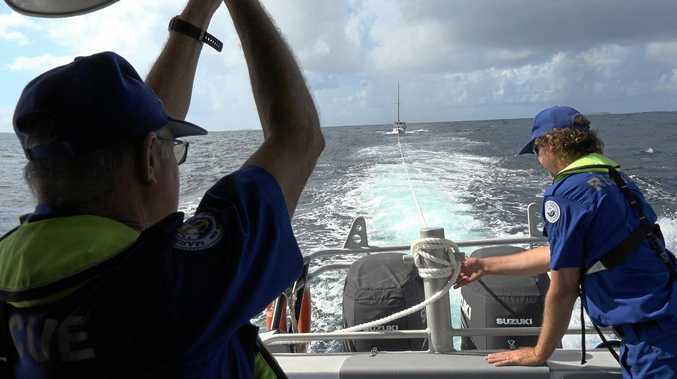 It’s not one for the faint hearted, so make sure you are well and truly prepared for the trip. I would not advise doing it on a last-minute whim. It is also a good idea to do some reading on the history of Gallipoli as this will be at the centre of much discussion and it will help you to feel less lost if you actually know some of the facts. We found Gallipoli by Alan Moorehead to be a very interesting and helpful read. Many companies do tours to Gallipoli, both for Anzac Day and at other times. We chose to travel with on the go, but other companies who make the trip include - but are not limited to - Fanatics, Fez Travel and Top Deck. Both Emirates and Turkish Airways fly to Istanbul from Dubai. For more information contact your local travel agent.